I really see how things get addictive! The top two rows are my favourite on this treasury I called, Spring Spring - Pretty Things. I had a little trouble uploading photos for this one but got there in the end. Can you tell I like monochromatic palettes? They are such fun to curate!!!! Oh...one item has already disappeared. It may have sold, or it may have just expired, in which case, the seller should re-list soon. 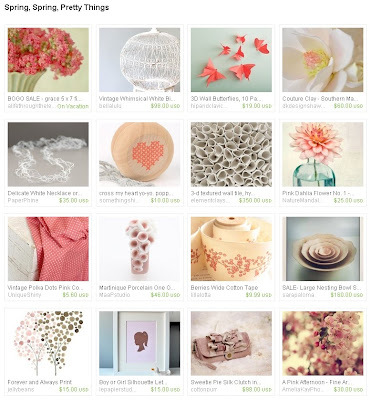 Very pretty treasury! I love the softness and the colors really go well together.